Renesmee, though, would probably like production Audis a lot--namely their design and all-wheel drive. Personally, I watch Married with Children, Top Gear and some stuff on the History Channel. I wonder if Nessie would be interested in those show (though I've asked about TG and MWC already)? And would Nessie have pets, since I have a couple of new kittens? And out of the British Top Gear hosts, which would Renesmee most likely get along with: James, Jeremy, or Richard? Edit: Does anyone think that Lily Collins could make a good adult Nessie? Sorry to double post, but where is everyone? There hasn't been anyone hear in nearly a month, and I even updated my previous post with a casting suggestion for a full grown version of Renesmee. Sorry I haven't been here in a while. I know it's no excuse, but real life is getting in the way big time. I just started my internship and damn it's hard! Average work hours: 9am-7pm. Average break-time per day: 30 min. And the work I have to do is both physically and mentally exhausting. I'm beat. And it's only just starting. Anyway, since tomorrow will be a slow day at work, I decided to spent my evening on the Lex. So, let's see. Because only Chernaudi posted since my last post, I'm not going to quote everything. I will just vent my thoughts on some of the topics you brought up. Sorry I'm not really familiar with Audi. I don't follow racing that much, unless it is F1 and Audi is not in that. My dad follows F1 ever since I can remember and I've sort of tagged along and still watch it every now and then. I have watched a couple of episodes of Top Gear though. But I only watch it because I find it hilarious, I don't really care that much about the latest designs or technicalities. (Guess I am a woman in that way ) The best parts for me are the challenges and road trips they have. The one where they have a race with two cars on top of each other and only the driver in the upper car can steer while the driver in the lower car has to give gas and break etc. and then one of the drivers loses his prosthetic arm because it gets stuck on the steering wheel. That one is classic. (found a youtube of it, arm around 7:10) Or the one where they have to drive across South America in these really old 4x4's. From your link, I noticed that James May has a lot of older cars too. I think Renesmee would like some of the classic models, just like I think she would really enjoy the History Channel or Discovery or Nat. Geo. or anything like that. Seeing as she loved Zafrina's gift, I would say she loves experiencing different worlds. And this includes historic times I would think. Lily Collins would be a good choice for adult Renesmee! I don't know her that well, just from the promo for Taylor's new movie. And I never really related her to Twilight characters, but she does look a lot like how I picture adult Renesmee. Just with slightly more red in her hair. Maybe that's a question for the Twilight Science topic: Can Renesmee communicate with animals and things other than people, vampires, werewolves/shapeshifters, and other hybrids? Hi there everyone! I’m here to invite all of you to Edward’s 110th Birthday Party! Isn’t it wonderful? One-hundred-ten, and still going strong! 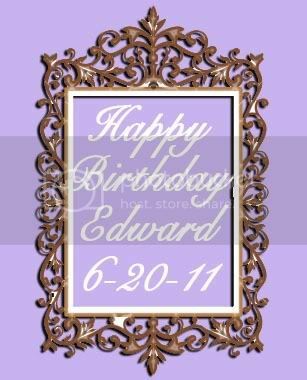 Anyway, we Cullens are opening a Birthday thread for him on the 20th, and we would LOVE for all of you to stop by and wish Edward a Happy Birthday with us! This year, the Mods are not just allowing pictures of presents, they are allowing EVERYONE to make him a birthday card or greeting and post it as an image! Esme and I are so excited to see all your artistic creations! You need to post the banner on another site (such as Photobucket or DeviantArt) and then link the image here. So, everyone get creative, and let’s see what you can come up with! Oh dear, I see where this is going... NO headboards!. Weather is predicted to be cool and overcast with possible thunderstorms. Sport equipment will be available. Look for the Anniversary Bower in the Dartmouth Range. Bring tents, if desired, and personal items. Bears are within easy hunting range. The Cullens request that you do not feed locally on humans. Human guests are encouraged to potluck.